FAQs: What can I do if I get nervous speaking in front of others? Does the thought of speaking in front of a group make you break out in a cold sweat? Do you find yourself rambling or struggling to find the right words when speaking in front of your colleagues or clients? If so, you’re not alone. Public speaking is one of the most common fears in the United States. Unfortunately, almost every career involves at least occasional public speaking. Being able to speak in a clear, confident, engaging manner, whether to an audience of two or 200, is essential to professional success. So how can you overcome anxiety and present with clarity and confidence? The most important key to overcoming anxiety in public speaking is preparation and practice. Running through your presentation several times in advance, gives you the chance to refine your presentation style, and figure out how to drive home your message. Pay particular attention to the introduction and the conclusion, so that you can begin and end your presentation flawlessly. If the presentation is particularly high stakes, recruit a friend, colleague or professional coach or speech trainer to listen to you practice and offer feedback. Warm-up and relaxation exercises can also go a long way towards battling nerves. Take two to five minutes before your presentation to relax and do some vocal and body warm-up exercises. This will not only help you feel more relaxed, it will also make your speech and body language more fluid. Lip flutters, tongue rolls and humming are all great ways to warm up your voice. Stretch out your neck and shoulders too to release tension. Last year we worked with a CEO that was very comfortable presenting to small groups or even very large audiences of 300 or more. However, he became very anxious in front of mid-size audiences (about 30 to 50 people). After a few sessions of practice with the warm-up and relaxation exercises, he increased his confidence, decreased his anxiety, and went on to present to all size groups with comfort. Finally, don’t forget to breathe! Closing your eyes and taking a few deep breaths before you present is remarkably effective for helping you to calm down and focus on the task at hand. Taking deep breaths from your abdomen as you speak helps you retain this calm, and also gives power to your voice. 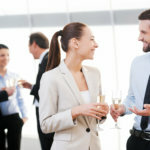 Next The Key to Professional Connections? Building Rapport!